The Cultural Showcase is an event put on by Black Student Union to celebrate the cultural diversity on PLU's campus. 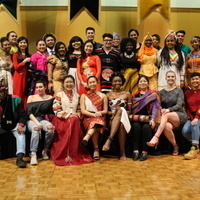 It includes a fashion show where individuals can express their identities through their clothing, as well as other performances. Doors open at 7:45 PM. Many students and organizations will be featured at this event. Everyone is welcome to sign up. If interested in performing please contact Olivia James (jamesoj@plu.edu). Please inform your friends and families, and we hope to see you there!